Baseball Field Equipment is normally something which doesn’t cross a coach’s mind until he encounters an atrocious baseball diamond in which the surface is nearly unplayable and dangerous for his players. We tend to concentrate on teaching baseball skills, philosophy, strategy and other factors which increase the players’ abilities. However, no different and perhaps just as important or possibly more important than proper player equipment, such as catching gear or batting helmets, is a proper fielding surface to play the game on. A poor infield, such as rocky or uneven, and an outfield littered with holes or deep depressions, can create a formula for players incurring injuries, possibly severe. Our number one goal as a coach or field manager is Player Safety. That being said, as our intended goal, let’s look at issues and solutions, which create not only a safe playing field, but one that will instill pride and a feeling of playing in an MLB quality stadium. Protective netting serves several different purposes depending on its location and height. The obvious reason to install protective netting is Player and Spectator Safety. Depending on the configuration of the backstop and fan seating areas, netting may be required above, behind or adjacent to the backstop to prevent foul balls from striking and injuring fans. Again, depending on the baseball park’s configuration, netting may be necessary to install stretched high along the first base, third base or both foul lines. This may be required to prevent balls from entering another playing field or for protecting spectators or pedestrians. In addition to player and spectator protection, one should consider the possible property damage a foul ball can create, such as dented cars, broken windshields, property damage of adjacent buildings or property and the expense of lost baseballs, which can quickly amount to a substantial cost to the association. Netting for baseball or softball fields should be 1 ¾ inch squares, in gauges of #18, #36, #60 or #96, and comes colored Black, White or Green. 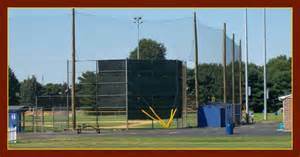 Backstops, especially in youth or amateur baseball parks, are historically constructed of chain link fence with steel supporting poles. These types of backstops are reasonably cost efficient, long lasting and durable, and easily repaired and maintained. However, depending on the situation, the installation of a backstop pad may be critical for player safety and game influence. The distance from the Home Plate area and the Backstop is the Determining Factor of whether a pad is required, although cushioned padding may be installed for ecstatic purposes alone. Another factor to consider is how you want the ball to play off the backstop. I’ve seen backstops with wood boards attached, which protects the player and reduces the damage to the baseball, but a passed ball or wild pitch bounced right back to the catcher, which prevented a runner from scoring. In my opinion, in older league play, an error should have some sort of consequences, therefore the forgiving wood rebound should not be allowed. Should the foul area behind home plate be small, the chances of a catcher running into the backstop while chasing a foul ball fly is a concern. The same can be said of the catcher running after a wild pitch or passed ball. Backstop padding is normally made of 2” High Density Polyurethane Foam, encased in various plastic or composite materials. The neat thing about them is they are easily customized with pictures, graphics or lettering of the Baseball Association or Team. Baseball fields with perimeter fences along the outfield and sometimes along the foul baseline territory, are normally chain link type fencing. By nature of construction the chain link fencing normally extends above the top railing, which can create a Cut Hazard for a fielder reaching over the fence attempting to catch a fly ball. Fence Crown, which is a plastic covering which encases the sharp prongs of the chain link fencing, is essential if the fence’s height is low enough for a player to reach over it. The protective crown is easily installed with a few basic tools and doesn’t require any special skills. 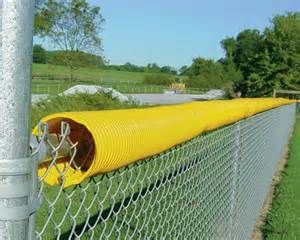 Compare cost of prefabricated fence crown to that of corrugated drain pipe. Corrugated drain pipe, available at any Home Improvement Store, can be cut with a jig saw, saw all or other tool, which allows it to slide over the top of the fence. Secure with electrical tie straps and you have a fence crown which will last forever. The only restriction over prefabricated crown is color. The use of wind screen along the outfield fences may be required if the action or scenery beyond the field creates a distraction. For instance, if there’s another baseball diamond adjacent, which could confuse players as to what actions were occurring on which field or distract players, such as traffic from a highway directly in line behind the pitcher making it difficult to find the baseball, a wind screen should be utilized. 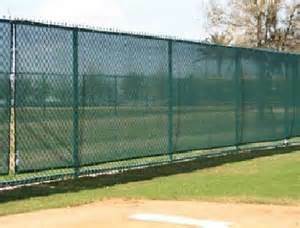 The wind screen is made of a breathable fabric, wind passes right through it, which comes in various colors which insure a good back ground vision for the players to be able to see the baseball. These screens can be customized, which could alleviate the cost to the association, by selling advertising to companies. Graphics, symbols, names or trademarks of a company can easily be displayed. Inclement weather is a fact of life and nothing can throw a monkey wrench in a tournament schedule quicker than an over night rain storm. The tendency for tournament directors to force play on an otherwise less than perfect infield, is always a problem. That’s not to talk negative about tournament directors, I’ve been one. The pressure to play from coaches, who have set aside a certain time period for play, otherwise experiencing extreme schedule conflicts, is intense. Scheduling, money, quality and reputation of the tournament are also at stake. The use of Infield Covers can be invaluable in situations such as this. 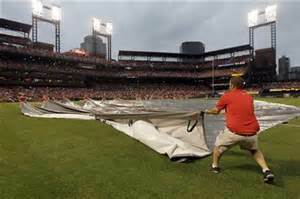 Infield covers or Tarps, come in many sizes and methods of securing them. A. Full infield tarps cover the entire infield including the batters box, and as most infields are totally dirt, this tarp provides the maximum protection. It, unfortunately, is also the most expensive and requires manpower to cover and uncover the field. However, if the expense can be justified through tournament revenue, the purchase should be given very strong consideration. A handful of people equipped with wet/dry vacuums, to remove puddles of water from the tarp prior to removal, a little field grooming and dry weather can have an infield playable in an hour or less. 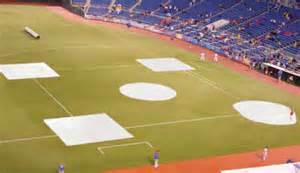 In the event your diamond has a grass infield, there are tarps specifically designed to cover and protect the Non-Grass areas, such as the Bases, Pitching Mound and Batter’s Box, On Deck Circle and Bull Pen area. These are light weight and the size make them manageable for one person to handle, although two people would make the task faster and easier. There are certain materials formulated and designed to put onto and into the infield dirt to speed drying. One such additive, it’s produced under several different name brands, is designed to mix Into the infield diamond dirt to aid in evaporation. The common mixture of 74% Silicon Dioxide, 11% Aluminum Oxide and 5% Hematite, create a chemical reaction which speeds drying. It is completely safe to humans & animals in case you’re wondering. Diamond Dry, a moisture absorbent is designed to be evenly spread on the wet area and raked in. It’s not uncommon for a fairly wet field to be made play ready in an hour. You’ve spent a considerable amount of money and Time creating the Best playing diamond possible which is very well groomed, level, rock free and drains quickly. How do you maintain it from the normal use and abuse of practices and a full game schedule? The use of batting mats can reduce the wear and tear of holes being dug on the pitching mound, at the pitching rubber, the batter’s box being rutted, by hitters digging in, and the bull pen areas becoming a mine field. 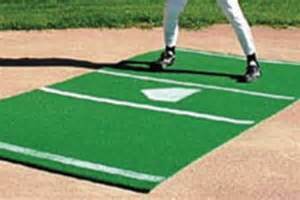 These mats, which come in various colors, are designed to take the punishment instead of the infield areas and are easily and quickly put down and removed. They accommodate cleats, rubber and steel, and although will not allow the hitter to “Dig In“, affords sure footing for hitting and throwing. These few Baseball Infield Equipment ideas, along with the outfield protection, will be of great value to you in terms of time and aggravation when attempting to deal with harsh weather and abusive play conditions.